As promised… I have a few more font favorites today. If you missed the first FAVORITE FONTS SERIES #1 check it out. 1. Saint Agnes – LOVE the handwritten look to this font. 2. Bookeyed Suzanne – Another handwritten font, this one with a bit of swirls. 3. Traveling Typewriter – I can not resist. I LOVE a sweet vintage typewriter font. Plus it is FREE! 4. Bergamot – Bold hand-drawn serif font. So lovely! 5. Mrs. Eaves Small Caps – Elegant and super popular with wedding invitations. 6. 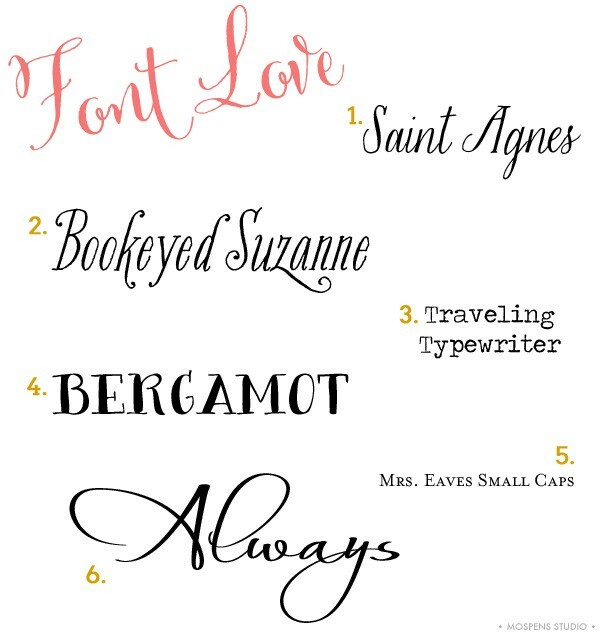 Always – This font is CRAZY popular for wedding couple names on custom invitations in our studio this week! Well, that is a wrap! Back to designing logos and my baby + kids stationery collection! I look forward to resting on Sunday.